I’m one of those people that will prepare for something well ahead of time if given the opportunity. Part of the reason for this is that my illness demands I limit my energy stores each day so I don’t over-do it. So if I can perform a portion of a large task ahead of time, I will. I risk doing too much or having a part of the work require a re-do at times, but I’m clever and flexible enough to work with that. 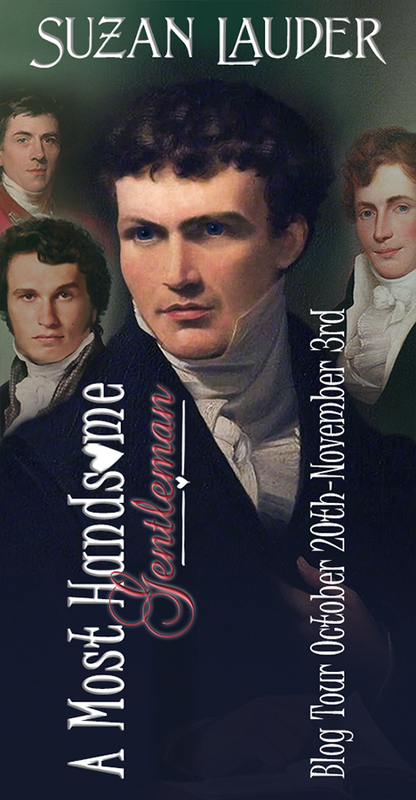 In the case of my blog tour for A Most Handsome Gentleman (aka #HOTCollins) in October-November 2017, I prepared a few too many posts. What to do? Well, I decided to share a blog tour bonus here on road trips with the redhead. It’s too late for the giveaways, but not too late to read the hijinks that went on during the fifteen days of blog posts. Today’s post is the first of four and consists of a recap of the blog tour for those who missed any posts or want to re-read the hilarity or benefit from the excellent book reviews. Below are direct links to the A Most Handsome Gentleman blog tour posts with a description or quote for each post to entice you to click the link and enjoy the read. 10/20 My Jane Austen Book Club: Suzan Lauder interviews Elizabeth Bennet, narrator of the novel A Most Handsome Gentleman, PLUS an excerpt with Elizabeth Bennet and her handsome cousin, Mr. Collins. 10/21 My Love for Jane Austen: Guest Post: A Glimpse into the Family Life at Longbourn. 10/22 Obsessed with Mr. Darcy: Review: “Fantastic dialogue and surreal conversations, which made me laugh out loud numerous times. I liked lots of things in this book, but best, Darcy’s and Elizabeth’s proposal.”—5/5 ice cream bars. 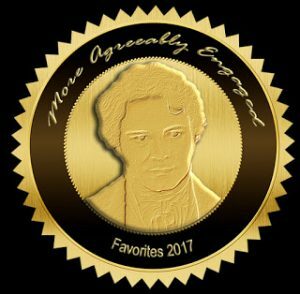 10/23 Austenesque Reviews: “A New Rector for Hunsford, part 1.” This brand new vignette chronicles Mr. Collins’ first job interview with Lady Catherine from the grand lady’s point of view. Part 2 at Laughing with Lizzie (below). 10/24 Tomorrow is Another Day: Review: “…changes in the development of the love story between Darcy and Elizabeth [are] described in a very sweet way (I loved many of the scenes that see them together). Congratulations to the author for having made such a famous masterpiece comic while still keeping Jane Austen’s style.”—Rating: 5/5. 10/25 Babblings of a Bookworm: Guest Post: In Praise of Voluptuous Ladies. 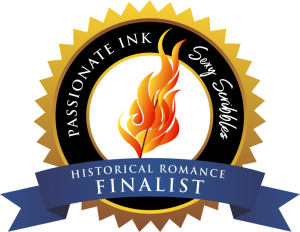 10/26 From Pemberley to Milton: Review: “I had a great time reading A Most Handsome Gentleman and could not recommend it enough for those who want to relax and enjoy a good comedy. It is a highly entertaining book that will make readers laugh out loud from the first page until the last. Suzan Lauder took a risk by venturing into this new subgenre but she nailed it!”—4.5/5 stars. 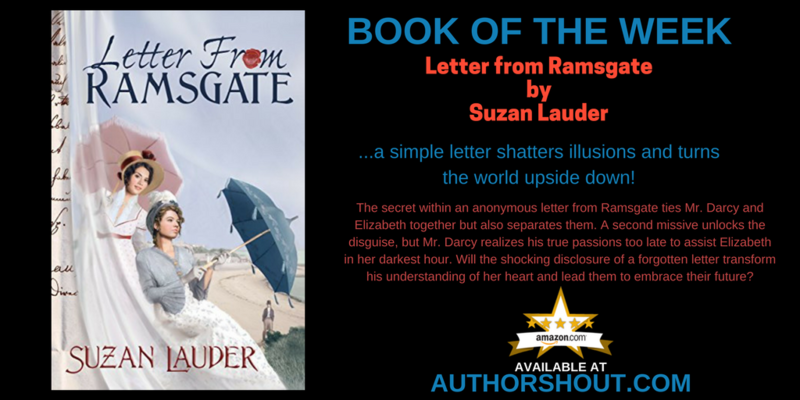 10/28 Darcyholic Diversions: Saucy Salutations with Suzan: an Interview with Suzan Lauder. 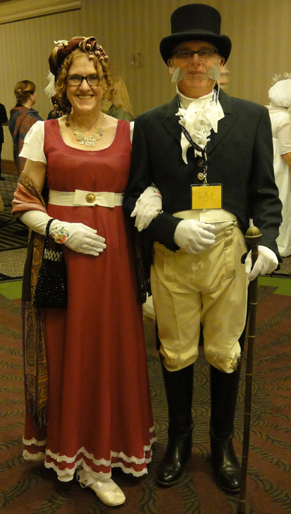 10/29 My Vices and Weaknesses: Meryton Residents speak about Mr. Collins: a modern/Regency mashup interview featuring Katherine Bennet, interviewer. 10/30 Half Agony, Half Hope: Review: “I will be reading this book again as it was funny as hell. I definitely recommend this book if you want something to read that’s fast and funny.”—4/5 stars; Excerpt: Mr. Collins breakfasts with the Bennets. 10/31 Laughing With Lizzie: “A New Rector for Hunsford, part 2.” A continuation from Mr. Collins’ point of view, this brand new vignette chronicles Mr. Collins’ job interview with Lady Catherine. Part 1 at Austenesque Reviews (above). 11/01 Diary of an Eccentric: Review: “Just as Jane Austen herself portrayed the ridiculous in her novels, Lauder does so here. Mr. Collins’s over-the-top speeches and Elizabeth’s first-person narrative, alternately witty and snarky, had me wishing the book wouldn’t end.”—5/5 stars. 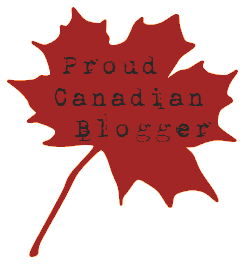 11/02 So little time…: Excerpt: Jane Bennet’s pudding PLUS a Guest Post: Recipes from great-Grandma Lauder and an 1823 cookbook. 11/03 Margie’s Must Reads: Review: “Suzan Lauder can write! 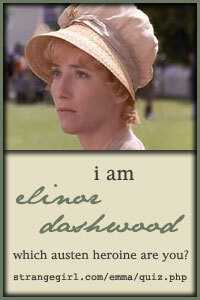 She writes such wonderful prose, such wonderful dialog and such an exceptional plot it was so hard to put down. Complete with scandal, intrigue and merriment, A Most Handsome Gentleman has so many laughs and so many swoons you will love every single word!” —5/5 hearts. A bonus non-blog tour post on November 21, 2017: Obstinate Headstrong Girl: Excerpt: The Bennets meet Mr. Collins for the first time. This filled a gap between the blog tour and my resumption of blog posts on road trips with the redhead. 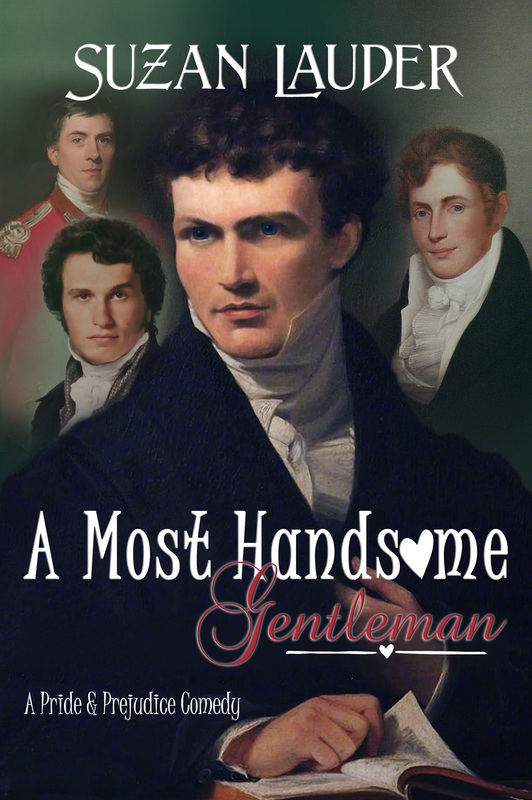 If you missed the giveaway of eight e-copies of A Most Handsome Gentleman courtesy of Meryton Press, I encourage you to go out and purchase and review this funny book. Authors love reviews of all types! Or, read on for a chance to win a signed hard copy. The future three posts for this series will be two excerpts from the book and a Learning from My Mistakes related post about the point of view I utilized in A Most Handsome Gentleman. Look for them on Tuesdays over the next few weeks. The Learning from My Mistakes series will resume after this break with a few additional posts before the draw for the prize. Blog followers and all commenters during the Learning from My Mistakes series are entered in a draw for a gift package including a signed paperback copy of A Most Handsome Gentleman, an A Most Handsome Gentleman book bead to hang on your purse or backpack, and the winner’s choice of a handmade Thrift Shop Regency Costume Experiment item by Suzan Lauder (pineapple reticule or “grown-up lady’s” lace cap). Best of luck, blog followers and commenters!